Progress on the raised bed garden has been slow and steady. I was able to transplant my leeks, some arugula, my strawberries, some mustard, yellow and red onions, shallots, some chamomile, beets, celery, calendula sprouts and a couple of stray garlics and bok choys out of the ground and into the bed. This now leaves me lots of room to erect raised bed #2. The first bed has also received some amendments, I added 1kg of crushed eggshells and have been moving the partially decomposed woodchip mulch layer from the former ground-level bed on as a top dressing. The initial fill of soil has settled around three inches lower and it would be a shame to bury all that rich worm-filled media at the bottom of bed number 2. Everything you see planted in this bed are edibles that overwintered in the ground and are now starting to take off with new growth. I was surprised to see the celery survive and I look forward to lots of it this year, I use it often when making stocks or mirepoix for soups and sauces. The arugula self-seeded as always and I’ve already been eating it for weeks. The leeks are really filling out and I’m looking forward to making them into soup too. I’ll probably also let a few go to seed so I can replant them next year. They are expensive to buy in the grocery store and keep in the ground year-round. My strawberries never fared well on the ground for some reason, and I kept losing plants. I maybe got 6 strawberries out of them last year. They were the first transplants into the new bed and despite my concern that the soil would be too “hot” from being taken directly out of the chicken pen, it seems that they are very happy now and have been putting out fresh new growth. Please let’s have a real strawberry harvest this year! An unexpected benefit of the raised bed is more light can reach the plants. I don’t know why I didn’t realize that before, but I’ll take all the extra light I can get. This bed is right next to the coop, so it’s a bit shadier than the other two will be. I also leveled out the pathway between the beds and lined it with old paper feed bags. My hope is to eventually cover this with a nice thick layer of coarse wood chips to provide good drainage and weed control. If I can’t get a free wood chip delivery I’ll make do with straw. In the meantime, the feed bags can start to decompose. I have about a million of them taking up space and it’s great to finally be able to use them. Some of the damp bags were even beginning to colonize with wispy white strands of mycelium. I guess if I don’t use them all up in landscaping projects, I can set up a stack of them to grow mushrooms! Eventually, unless your chicken pen/coop is built like a fortress, you will have rats. Especially in an urban setting like mine, where rats already exist due to human presence, the lure of eggs, chicken feed and sometimes even young chicks is too much for them to resist. A desperate rat will even munch on feathers and chicken poop. The best rat control of course is always a good cat or dog, but some rats are too tough for the average farm cat or too wily for the average dog. My cat Parsley is usually the RCO around here (Rat Control Officer), but she will often come home very beat up from a rat fight, with scratches on her little face, neck and ears from the battle. My dog will kill a rat if she can catch one, but she comes inside at night and that’s when they’re most active. Between them we’ve kept our minor rat issue under control until now, but now we have a special rat who refuses to be caught. This extra intelligent rodent has decided to dig a maze of burrows underneath my chicken pen. It knows that the cat and dog can’t get at it if it comes out only inside the chicken pen at night, which is fully enclosed but does not have a wire mesh floor. It stays cozy and snug in its burrow by day, and raids the chicken and duck feed at night. The area around the pen looks like swiss cheese, and I never know when the ground beneath my boot will sink into a rat hole. Parsley has come home more than once with torn ears from battling this menace. Now this particular rat has also developed the audacity to begin stealing eggs. Even though there is always an abundance of feed and grain inside the coop, this rat has cultivated more refined tastes. I have a basket hanging on the outside of my coop that I use to collect quail eggs. I usually bring them inside but some nights I forget. Just the other day, I noticed two quail egg shells laying on the ground that looked peculiarly like they had been nibbled open. He had climbed up, stolen two eggs out of the basket and eaten them at his leisure. Time to get serious! The issue with catching rats inside a coop full of birds or in a yard with a lot of small pets around, is that you don’t want one of your cats or chickens getting injured by mistake. Rat traps are serious business and they could easily crush a delicate paw or feathered neck. I won’t even get into using poisons, as that can be even more dangerous for pets or wildlife who may later consume a poisoned mouse or rat. No, I want to use a good old fashioned Victor rat trap, but it needs to be used safely. After doing a little research I came across the idea of the weasel box. A weasel box is a little wooden box about the size of a large birdhouse, that is used with bait and a trap inside to catch weasels. It has a hole at one end for the weasel to enter, and a smaller hole at the back covered with wire mesh, so air can flow through the trap, wafting the scent of the bait out and also reassuring the weasel that there is an escape route. Now I’m lucky enough to not to have weasels where I am, but one day I plan to get a larger and more rural piece of property where they will no doubt be an issue. Until then, this seemed like a perfect solution for my rat problem. I built it in one evening, purchased my rat trap and set it up near the base of the coop, baited with two fresh quail eggs. The front piece should have a 2″ hole drilled slightly above center, and the back should have a 1.5″ hole drilled in the center, and covered with a square of 1/4″ wire mesh. I attached mine with a heavy duty staple gun. It’s the perfect size to fit one of the large Victor rat traps. Put your bait next the mesh end of the box, and set your trap so the yellow or copper bait pad is next to it. This is so the rat doesn’t jump over the pad when entering the box, and also to keep the dangerous part of the trap as far away as possible from curious cat paws. If you have the kind of cats who like to stick their hands into hidey holes, you may have to attach an extender to the front entrance hole so they can’t injure themselves. The rear of the lid should be attached with hinges, and the front can be fastened with a hook and loop type closure. I don’t have these parts ready yet, so for now my lid is held closed with a bungee cord. The trap is set up tonight for the first time, and hopefully I’ll be able to report its success very soon. I’ve also seen many wooden nesting boxes used. To me, that seems like a lot of work for a heavy nesting box that will absorb urine and is difficult to disinfect. I know the importance of disinfecting nesting boxes after each use as I had to deal with a couple of cases of mastitis last year. My rabbit recovered both times but it’s not something I’d like to repeat. A nice solution would be if there was something cheap and plastic I could buy at a hardware store that would fit the bill, sort of like a squat planter box maybe. Something like that may exist, but I haven’t found it yet. I have wondered if a plastic dishpan might work, but I have yet to try this out. So my solution was to follow guidelines in the Storey’s Guide to Raising Rabbits and build wire mesh nestboxes. 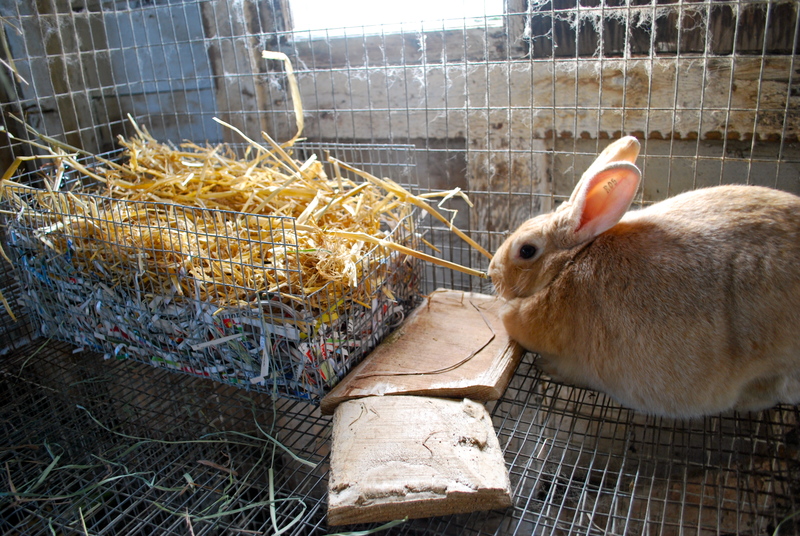 I had already built all my rabbit cages, so I already had the mesh and tools. Despite the popularity of the book, I don’t think I’ve ever seen anyone else ever use a box like this, for whatever reason. I know once I posted a Youtube video which showed the box in use, a local rabbit breeder I know commented to me that she noticed I was using wire boxes and to not be surprised if I lost most of my kits. That scared me a bit. I asked her why, and she said the kits would either get too cold or the mother would flip the lightweight nest over. Well, I wasn’t going to let either of those things happen. At first I would cut out a fresh cardboard liner for each new litter, then fill the box with woodchips and straw. The cardboard had to be in one single piece or the does would pull out each side and toss them. Well, turns out you actually go through a lot of cardboard that way and measuring out and cutting the liners is tedious. I hated it. I also need my used cardboard to make packaging for my other business and there’s no way I’m going to go and buy new cardboard. Do you know how expensive it is? I experimented once without the liner and all the woodchips fell out through the mesh in just a few days. Thankfully the kits survived but I needed to add new bedding each day and they were obviously struggling to stay warm in the depleted nest. Now I think I’ve found a better solution. I don’t know why I didn’t think of it before, but this time I shoved a whole bunch of shredded newspapers into the bottom of the nests and topped them off with the straw. 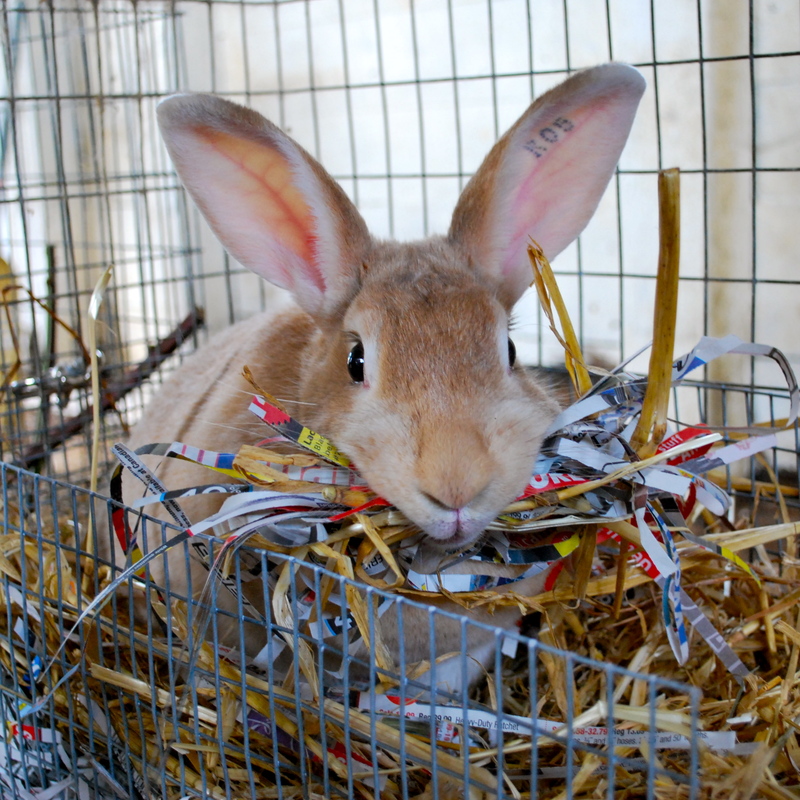 The problem with straw is that my rabbits like to eat it. Generally though enough is left in the nest for it to work. They won’t be eating the paper I bet. So far, it looks like the shreds make a nice soft and yet solid base to the nest, and it doesn’t seem to want to fall out the holes. The rabbits seem happy with it and it’s absorbent, practically free and should insulate well. I keep the does from moving or flipping over their nests by attaching the back to the cage wall with a dog leash clip. These wire mesh nests are nice and light when removing them to inspect kits, they can be very easily sanitized in a container with some bleach and water, they were cheap and easy to make, and they’ll last a very long time. I worried a bit about the sharp front corners at first, but I smoothed everything off well with a grinder when I made them and the rabbits seem to have no problems. I’ve seen enough wild rabbits deep in bramble bushes to know that they know how to avoid being impaled on sharp objects. My nestboxes are made of 1/2 inch by 1 inch rabbit cage flooring wire, and measure 18 inches long by 10 inches wide by 8 inches tall with a 5 inch tall front lip. They are held together with hog rings or c-clips.